I wouldn't say that cooking curry is my forte but I have great love for it. There's always so much to explore with the tremendous variety of spices and curry powder that is available in the market. Half the names challenge my memory! There was a period in my young life that I avoided cooking 'dal' altogether because I was under the impression that it involved long soaking and cooking hours < ---- conclusion made after seeing the amount of effort mom puts into it. I had not realised then that there was more than one variety of dal. Oh, don't snigger. In all my early childhood, I had only ever been introduced to mung dal aka yellow lentils. The ignorance bubble was burst when I steeled my spirit to master mom's recipe. By golly and wonderment! It seemed that there was more to dal than I imagined. That's how far my assumptions got me, a step nowhere. Whole red lentils (Masoor Dal), I have now discovered, are my favourite. A quick 30-minute soak before cooking and just half an hour of simmering time to reach desired state of mushiness. Hah! I'm sharing this recipe because I love it so much. It is a tasty flavourful vegetable dish that arose out of a desperate need to clear zucchini from the fridge. Incorporating it into a red lentil curry recipe is nothing new but I have never tried it ...until now, that is. 1) Heat oil in large pan. Saute garlic and onions. 2) Stir in turmeric and chili powder wet paste. Fry it a little. 3) Then, add tomato puree, fresh tomatoes, carrots and zucchini. Mix well. 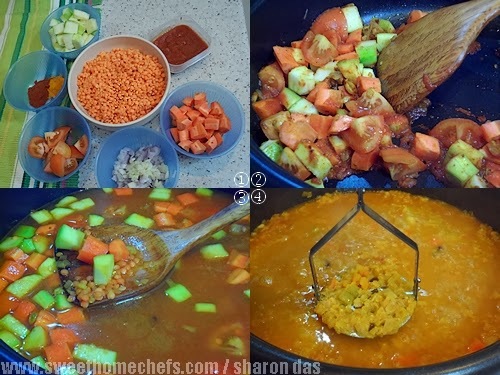 4) Stir in red lentils. 5) Add water. Season with salt and pepper. Leave to simmer for half an hour or less until lentils look smashed. 6) Using a potato masher, roughly mash the larger ingredients. That's it! 7) Serve with fried chili, spices and onion stirred in (fried separately in another pan - see note above on adding an aromatic touch). Red Lentil Zucchini Curry - Serve with fried chili, onions, spices. Stir before enjoying! I'm submitting this post to Our Growing Edge, a monthly blogging event by Bunny.Eats.Design aimed at connecting food bloggers and inspiring us to try new things. This month's event is hosted by Alice from nom nom cat. Check out her yummy food posts! Looks yummy, yummy! I love all kinds of dal but this one is what we have more often than any other variety. Just like in this recipe I also make it a point to add veggies in it. this looks amazing and lush and delectable! Great recipe and submission to Our Growing Edge. I have to admit, I don't know much about dal and have only cooked with lentils a couple of times. I'm a bit wary of lentils because I'm worried that my husband won't eat it. I'll have to trick him first and once he tastes it, it will be ok to reveal that it's actually good for you.